Losing them would have a big impact on other fish populations and, ultimately, human livelihoods. “They have very few relatives on the tree of life, so they are very unique and losing them will actually represent a big, big loss,” said Fran Cabada. The assessment found fishing, both targeted and accidental, was to blame for the steep decline in many of these populations, together with habitat loss due to coastal development, degradation of mangrove forests, water pollution and trawling. “The Edge sharks and rays list comprises some of the most interesting and unique fish we have on this planet,” said Dr Matthew Gollock, of ZSL. This ray ranks first on the list. It is at risk from unsustainable fishing and being unintentionally caught in nets. The largetooth sawfish’s most distinctive feature is its snout (rostrum) lined with sharp teeth to slash its prey. Cowboy boots were once made from sawfish skin. 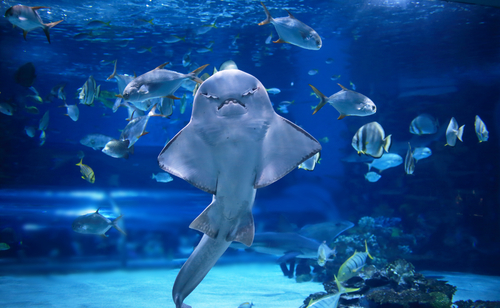 This ray can produce an electric shock, which it uses to stun its prey. The fish hide in sand or mud during the day and forage for worms and other small prey at night. This shark changes in appearance over its lifetime. The young are born with zebra stripes, which change to spots as they get older. It lives on the sea floor, and has a lifespan of 25 to 35 years. The biggest fish in the sea, reaching up to 20m (65ft) in length, it is a filter feeder, relying on plankton and small fishes to survive. The basking shark is the second largest species of shark (and fish) in the world behind the enormous whale shark.